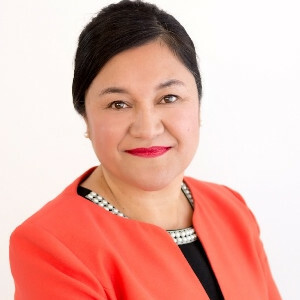 Arihia Bennett MNZM (Ngāi Tahu – Ngāi Tūāhuriri, Ngāti Waewae, Ngāti Porou) has been the CEO of Te Rūnanga o Ngāi Tahu since 2012. She is married to Richard and together they have a son Piri. She lives in Tuahiwi in North Canterbury with three generations of whanau (family) and is an active participant in her papatipu rūnanga. The wellbeing of tamariki, whānau and communities has motivated Arihia’s long career in social services initially as a social worker, and a trainer/educator for Child Youth & Family and then as regional manager Te Waipounamu (South Island) for Barnados NZ. In 2011 Arihia was appointed Chief Executive of He Oranga Pounamu, the iwi (tribe) mandated organisation responsible for health and social services in Te Waipounamu. A passion for enabling and empowering whānau and papatipu rūnanga to take control of their own lives, find their own voice and be the best they can be is a key driver for Arihia in her current role as she leads the organisation to develop the programmes and initiatives that will grow communities and create a better tomorrow for Ngāi Tahu whānau. Arihia has held advisory positions to government, including Canterbury Earthquake Recovery Commissioner (CERC) following the September 2010 earthquake. She has also held governance roles within Te Rūnanga o Ngāi Tahu, including as a director for Ngāi Tahu Development Corporation from 1999-2002, and chair from 2002 – 2005. Other former Boards roles include Barnardos NZ and the Christchurch Women’s Refuge (now known as Aviva). She is a current member of the Global Women’s Network and the Tuahiwi Māori Women’s Welfare League. In 2008, she was made a Member of the New Zealand Order of Merit for services to Māori and the community.